The bending of light as it enters a medium of different optical density; light is refracted only when it hits a boundary at an angle. It is not refracted if it strikes perpendicular to the boundary. When light enters a more optically dense medium, its speed is reduced. The angle of refraction is less than the angle of incidence. The refracted ray is said to be bent "toward the normal." When light enters a less optically dense medium, its speed is increased. The angle of refraction is greater than the angle of incidence. The refracted ray is said to be bent "away from the normal." The optical density of a medium determines the speed of light in that medium. A constant that is characteristic of the substance. It is the ratio of the speed of light in a vacuum to the speed of light in that substance. Its variable is n and it has no units. where n is the index of refraction, c is the speed of light in a vacuum, and v is the speed of light in the medium. Snell's law states that the ratio of the sine of the angle of incidence to the sine of the angle of refraction is a constant (or the ratio of the indices of refraction of the two mediums). 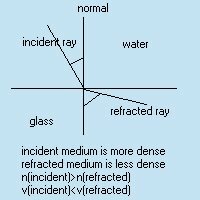 where n1 is the index of refraction of the incident medium, n2 is the index of refraction of the refractive medium, q1 is the angle of incidence, and q2 is the angle of refraction. Total internal reflection occurs when light falls on a surface of a less optically dense medium at an angle of incidence equal to or greater than the critical angle of the substance. 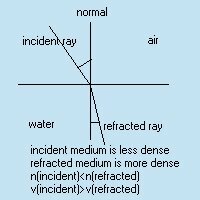 There is no refracted ray; the angle of refraction is 90° or greater. This is the angle of incidence in the more optically dense medium at which total internal reflection occurs. At this angle of incidence, the angle of refraction in the less optically dense medium is exactly 90°. Total internal reflection only occurs when a light ray passes from a more optically dense substance into a less optically dense substance. The scattering of light; the separating of light into its component colors. Dispersion occurs because light of different wavelengths travel at different speeds through a medium. Red light has the longest wavelength and the highest velocity. Violet light has the shortest wavelength and the lowest velocity. Any transparent object having two nonparallel curved surfaces, or having one plane surface and one curved surface. A lens creates an image by refracting light. A convex lens is always thicker in the center than at the edges. Light traveling through the lens goes slower through the thick center and faster through the thin ends causing the rays to focus or converge. The focal length of a convex lens is always positive. Real images are produced when the object is outside of the focus. No image is produced when the object is at the focus. Virtual images are produced when the object is within the focus. A concave lens is always thinner in the middle than at the edges. Light traveling through a concave lens goes faster through the center and slower through the ends. This causes the rays to diverge or not to focus. The focal length of a concave lens is always negative. Only virtual images are produced by a concave lens. A ray passing through the optical center of the lens passes through unrefracted. A ray incident upon the lens parallel to the principal axis passes through the focus; convex lenses use the focus on the opposite side of the lens and concave lenses use the focus on the same side of the lens.